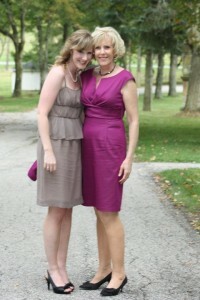 Creative Cravings catering business was created by Melodie Davis and Julianne Aday, a mother and daughter team, in 2010. We have a long history of entertaining in our homes, creating theme parties, and providing food for many family and friends’ events. We enjoy researching new recipes, creating interesting and delicious menus to perfectly suit an event, and making our food visually appealing and enjoyable. I, Melodie, have two married children, two granddaughters and live in Mission Viejo with my husband of 36 years. I am excited about this secondary career in the Culinary Arts and am currently pursuing a degree in this field. My other interests include teaching music in the schools through a company called Composer Countdown – designed to teach grade school children about great composers. I am also a pianist and keep busy playing piano for the choir and worship services at our church. I, Julianne, have been married for 9 years and live in the city of Rancho Santa Margarita. My mom and I have been cooking together since I was a small child. Since beginning married life, my passion for learning about the culinary arts has been ignited. I enjoy creating tablescapes that draw in the crowd and highlight the colors and beauty of the food. My other interests include teaching piano and playing with my three beautiful girls.